The Bubbles Style Bezel Set Round Cubic Zirconia Bracelet is a playful piece for the free spirited individual. A medley of bezel set rounds ranging from 2.5mm to 3.5mm appear to float around your wrist like a bunch of bubbles! 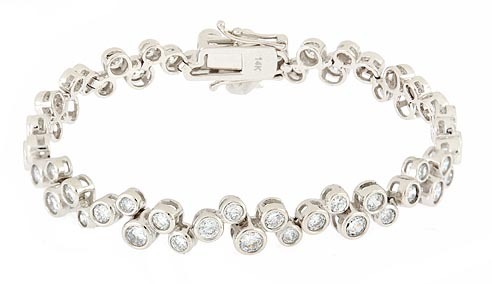 The Bubbles Bracelet measures over a quarter of inch wide and weighs a total of approximately 6 carats of the finest hand cut and hand polished original Russian formula cubic zirconia. 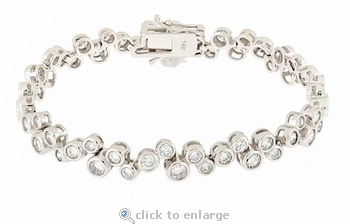 This bracelet comes standard at 7 inches long with a double hinged clasp. An upgrade to 8 inches is also offered. Choose from 14k white gold or 14k yellow gold, please see the pull down menu for options. For further assistance please contact us directly at 1-866-942-6663 or visit us via live chat and speak with a knowledgeable representative.